Because of its origins in South America, the tomato plant has very few natural pests here in Great Britain, although it will suffer the scourge of common glasshouse pests if they are grown under protection. In fact, you are far more likely to experience problems when growing tomatoes under glass or in a grow bag than you will ever get when growing directly into well prepared soil. Blackfly belong to the aphid family and if left to their own devices can turn into a severe infestation stunting the growth of your plants and reducing your tomato crops yield. So just how do you control blackfly on tomato plants? 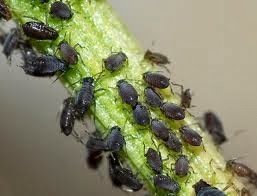 Cause: Blackfly are a well-known pest insect that can quickly colonise the soft tissue parts of your plant. They damage and weaken the plant by sucking the sap out of pressurised parenchyma cells just below the leaf cuticle. Symptoms: Clusters of these small insects are readily identifiable, normally at the plants tips or on the underside of their leaves. In severe cases, the infected parts can begin to wither due to the quantity of sap being removed from that area. The foliage can become sticky and may show signs of a harmless, black mould called sooty mould. Alternatively you can try physically removing the blackfly by either pinching out infested stems and burning them or by knocking them off the foliage using a pressurised spray from a hose. Just make sure that you do not end up damaging the plant in the process. Consider planting 'companion plants' such as tagetes or chives to repel blackfly or nasturtiums to help draw blackfly away.